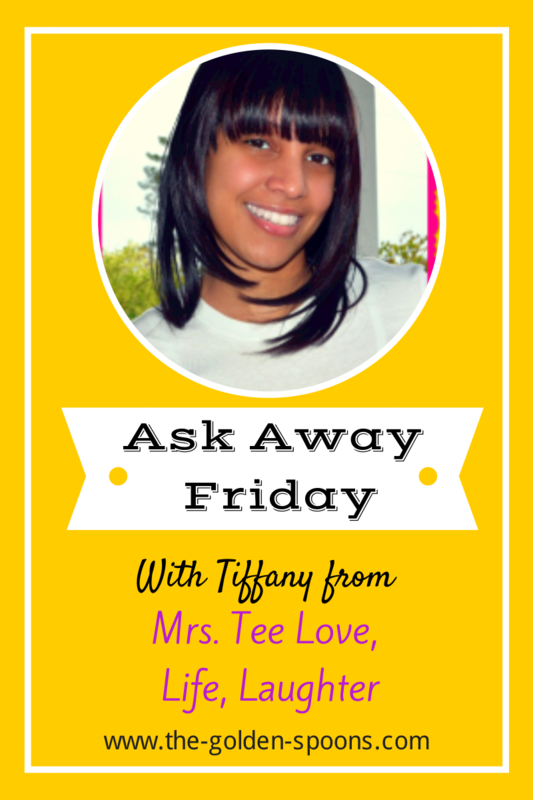 This week I'm swapping Ask Away Friday Questions with Tiffany from Mrs. Tee Love Life and Laughter! I think I first met Tiffany through SITS Sharfest, a Saturday morning Twitter party hosted by the SITS Girls. Then, she began participating in the Tuesday Ten I host with Rabia and, now, she's even our Tuesday Ten co-host for May! As I was doing a little research to come up with questions for Tiffany, I also realized that she is a fellow North Carolinian. It truly is a small world sometimes! 1. You're southern born and raised. What is you favorite southern quality? This is a tough one because I've never really known anything else. I have never lived anywhere other than the South. Southerners have a reputation for being hospitable and friendly. I've have generally found that to be true and love that about living here. Of course, we also have some really good food! 2. I am city born and raised but a happy southern adoptee. Are there any stereotypes you have/had about us city folk? Have you found them to be true or false? I think some southerners assume that "city folk" (and northerners in particular) are not as friendly and that they look down on Southerners as being less intelligent "rednecks." That's not true in my experience, though. I have met some big city transplants that are super nice and some of my best blogging buddies live in New England. When I first vlogged, I was worried that others would laugh at my Southern drawl, but several blog friends from around the country said it was "cute" and "endearing." Nobody made fun of me. No matter where you are, you will find nice people and not-so-nice people. It really has very little to to with where you were raised and much more to do with how you were raised. 3. I love the slower pace of the country and the overall friendliness. Have you ever been to the city and was it a shock to your southern charm? Yes! I went to New York City for the first time when I was in college and it was definitely a shock, especially when we got on the subway going in the wrong direction. I have also been lucky enough to travel to Paris. It was absolutely amazing, but so very different form my usual way of life. Lastly, I recently went to Las Vegas for the first time. That was some definite culture shock! Vegas is "in your face" all the time and I was not a big fan. 4. My Aunt was a Special Needs High School teacher for over a decade and often brought me in as a teen to help. I know it takes a very patient and tender hearted spirit. How did you decide to teach special needs? It was actually rather accidental. In college, I majored in child development and took several classes on inclusion and special needs. However, that was not my intended career focus. I went to college on a wonderful scholarship that required me to teach in the public school system for a few years upon graduation (or else actually re-pay the scholarship financially.) Well, there weren't many open positions for preschool teachers in the public school system, but I found one that was for a preschool special needs teacher that would essentially be co-teaching with a classroom PreK teacher. I interviewed, got the job, and naively thought "I took the classes. I can do this!" I won't lie, that first year was rough. By Christmas break, I was about ready to quit. However I had a great co-teacher who was also my mentor. She became (and still is) a wonderful friend. Through her support and many, many tears, I got through the tough times and fell in love with my students. I truly felt called to continue working with special needs children. I continued in the position for a few more years, eventually moving into my own classroom, until I had my first daughter and became a SAHM. 5. You mention your 'pull your hair out moments' and yes we ALL have them. How do you resist the urge? I escape to the bathroom or a book. If I can, I escape to my computer to blog or peruse social media. If I can't do that, I just try to walk away for a few minutes to my bedroom or maybe the bathroom and take some deep breaths. 6. You're a list maker. Do you make your list mentally, digitally or the old school pen and paper way? 7. If you could learn any sport instantly what would it be? Right now, it would be fast pitch softball! I played softball in high school and actually pitched, but it was slow pitch way back then. My oldest daughter is playing softball this season. Her league is the first age when they do kid pitch and she wants to be a pitcher, but it is fast pitch. It's very different from what I did and I wish I could help her more. 8. Share your funniest awkward moment. The most recent one I can think of happened at one of those school awards ceremonies at my two younger daughters' elementary school. I was sitting with some other parent friends and we were giggling at the scowl one of their daughters was sporting that day. She was obviously in a bad mood and the dad was lamenting about how moody his daughter had become recently. I joked that "maybe it's genetic!" trying to be funny and suggest that he was moody as well. Only problem?? His daughter is adopted - from China. Definitely an open mouth/insert foot moment! Fortunately, he laughed about it and retorted with a joke about me having a "blonde moment." 10. What's the last song you heard? Did you like it or hate it? #AskAwayFriday was created by Penny from Real Housewife of Caroline County as a place for us to connect with other bloggers by asking questions and getting to know each other better! Meeting other bloggers and making new friends is one of the best parts of this online world and #AskAwayFriday makes it fun and easy! I just found out we have more in common...my Master's degree is in special education! It's been very useful during my years of teaching. I do love your Southern twang, Lisa. It's a lovely accent! And I have those open foot insert mouth moments frequently - always accidental but still embarrassing! HA! Well, I'm still not a person who can sit still for long, but I know I couldn't keep up with the pace of NYC either! It has definitely come in handy over the years! I even think back to it now as I work in Children's Ministries at our church. Being a teacher is both rewarding and challenging. I'm sure you were proud of that moment. NYC, Vegas, and Paris - exactly the same cities I want to visit someday. Oh My to the awkward moment! LOL I once did the dread oh my goodness you look great how far along are you? *she wasn't pregnant! * LOL - I will NEVER do that again I don't care if they are in full on labor right in front of me... :D It was so much fun swapping with you and thanks for the great questions! I am stuck in the burbs, but I am definitely a country girl at heart! I also love your twang! I can't wait to hear it in real life soon at BlogU! I am a total list maker and list lover too! The world runs so much smoother when I can put everything I need to do on pen and paper! I love your comments about being a southerner. I was born in the city (Rotterdam, Netherlands) and also raised in a city and acutally lived in a city until 1 1/2 years ago. It's definitely a culture shock at times even though I live less than 10 miles from a city. Not having a shopping center in my town, or a supermarket even, that's really strange. It's great you teach special needs students. I didn't know that about you. I'm disabled myself and would love to one day volunteer with special needs children. I am going to need a list if my blog keeps growing the way it has over the last few weeks. Guess that is a good problem to have. Great swap. Love your awkward moment! I have inserted my foot a number of times... All joking aside, I have to agree with you on the Northerner / Southerner thing...there are nice people everywhere. I do think people are more aloof in the NE, but I have made plenty of good friends! I love your drawl! I'm from New Jersey and New York and there are thick accents there too, although I don't have one. I remember your first vlog very well! I used to spend summers in North and South Carolina so I have no stereotypes other than to say... LOVE it! I love making lists and I'm sad to say I recently started doing them on my iPhone Notes app. Although I totally still use Post-its and pens at home. I'm an old school pen and paper list maker myself! I've tried keeping lists electronically and it just doesn't work for me. I only keep a list on an app for things I think of when I don't have pen and paper! YAY FOR PEN AND PAPER LISTS! Long live old school! Seriously- when my husband tells me to "just type it on the note app" I cringe. Huh? How am I going to remember anything if I don't use a pen? I love southern accents and I agree that there are nice/mean people everywhere. That "blonde moment" comment would've bothered the heck out of me. But I guess you had it coming lol So glad to have met you through Tamara! She really is the best. Oh my! Yeah, I was asked that a couple times and vowed that I would never ask anyone else! Definitely fun swapping with you! We lived in the burbs for a while - it has its positives, too. There are definitely pros and cons to city life and country life. I hope you get the chance to volunteer some day - you and the children would get a lot from it. Definitely a good problem!! Mine has actually plateaued lately and it's very frustrating. Everywhere you go you can find friendly people and mean people. I guess hospitality is what the South is "known for," but there are plenty of not-so-nice people here too. I use the notes app, too. And, taking an iPhone picture of that refrigerator board has save me oodles of time. Thanks so much!! Hope you have a lovely weekend, too! I live near a medium-sized city, so I get to sample the city regularly without living there. I have been to a big Canadian city - nowhere near as big as NYC - and though I loved to visit, I left thinking I would never want to live there. I like the slower pace of a life outside the city, too. I agree - it's fun to visit larger cities, but I don't think I could live there long term. I'm an old school paper list maker too! I also have a whiteboard at my desk where I write down things we run out of so I don't forget when we go to the store. Snapping a picture of it is clever! Great pair up ladies! I live in a mid sized city in the midwest, but I have been told, all my life, that I have a funny southern sounding accent...funny thing is, I have never lived anywhere else. I bounce back and forth, but I think that I am slightly more partial to paper and pencil, for most things. 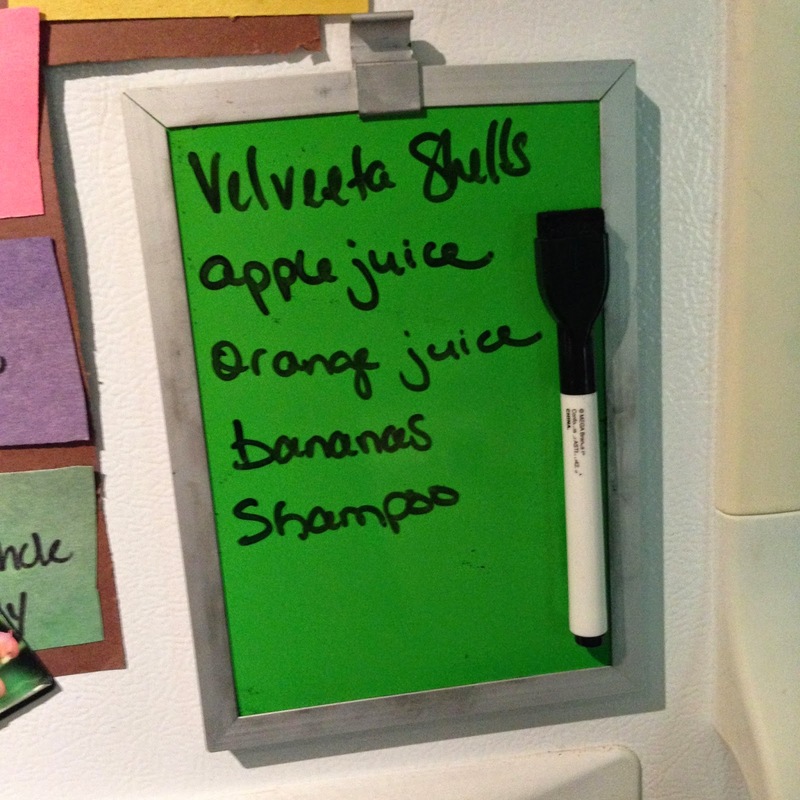 I love the dry erase board idea...I never even thought about it. Have a fabulous weekend, Lisa! I like pen and paper too for my to do lists. However, I recently started using the Kroger app for my grocery lists and love it. I think you are so right about behavior being based more on *how* you were raised than *where* you were raised. I do have a few friends that have similar attitudes from "up north," but they aren't bad characteristics, just different from how I would react. I do my grocery shopping online, but have never used an app for the list making. Interesting! Yeah, different isn't always bad. I definitely think it's more about the "how."